Are you considering the switch to a vegetarian diet? Here’s your guide to the different types of vegetarian diets, how to choose which one is right for you and ways to meet your nutritional needs. There are four types of vegetarian diets to choose from. Vegan: A strict vegetarian diet that eliminates all animal products, including meat, poultry, fish, eggs and dairy foods. Lactovegetarian: A vegetarian diet that eliminates meat, poultry, fish and eggs but includes dairy products. Lacto-ovo vegetarian: A vegetarian diet that eliminates meat, poultry and fish but includes eggs and dairy products. This is the most popular type of vegetarian diet. 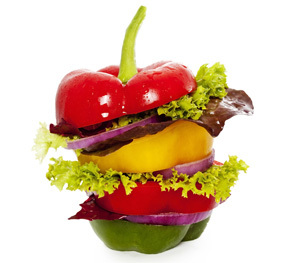 Flexitarian: This semi-vegetarian diet is based on plant foods with occasional inclusion of meat, poultry and/or fish. Eating a variety of different foods and proper meal planning is necessary to ensure your diet includes an adequate amount of essential nutrients. Vegetarians may find it difficult to meet their needs for the following nutrients. Iron Oxygen transport Beans, enriched cereals, whole grains, soy products, dark green vegetables, dried fruits, baked potatoes with skin Tip: Eat these food with Vitamin C-containing foods to boost absorption. If you’re concerned that your nutritional intake falls short of your body’s needs, meet with a registered dietitian (RD) who will evaluate your eating habits and make recommendations to get you on track with a well-balanced vegetarian diet. Stick solely to plant-based meals on one day of the week, then ramp up the number of meatless days to make the full transition. Many of your favorite meals can be made meatless with just a few simple substitutions. For example: omit ground meat from chili and add an extra can of black beans or soy crumbles. Instead of chicken Parmesan, give eggplant a try. Or expand your horizons and replace chicken with extra-firm tofu to make stir fry. Experiment with unfamiliar foods and recipes that fit within your approach to the vegetarian diet. Try a few of our favorite recipes! Always be sure to consult your primary physician or a registered dietitian before making any serious dietary changes. Choosing to become vegetarian can be a great health choice but if not done right, could cause potential problems. Check out the following sites for more information regarding going vegetarian!